My passion for cooking and experimenting with recipes could not be possible without good, quality spices. Lots of it. And there is one place in town which is a must stop for me. 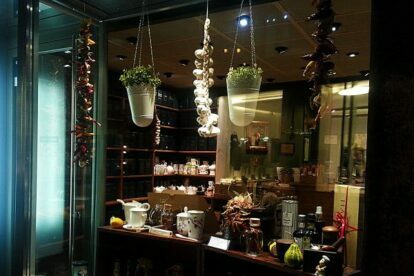 Harissa spice shop is situated in the center of the city and it is a place you shouldn’t miss whether you are a chef, a foodie or just want to bring a nice present home from your visit to Zagreb. The spice shop got its name from the North African spice harissa. They offer over 150 kinds of spices, herbs and blends and over 100 different types of teas. I will mention some of my favorites – Ceylon cinnamon, cardamom, black cumin, sumac, lemongrass, chili hairs, edible petals, five spice, chimiChurri, harissa, chakalaka. In addition to the products that they import from around the world, you can also find accessories for the kitchen, such as spice containers, special containers for garlic and onion terracotta salt shaker, flat cakes, currants and mortar. I hope that people will recognize the different scents, engaging in experimentation with spices instead of just using simple mixtures such as Vegeta.